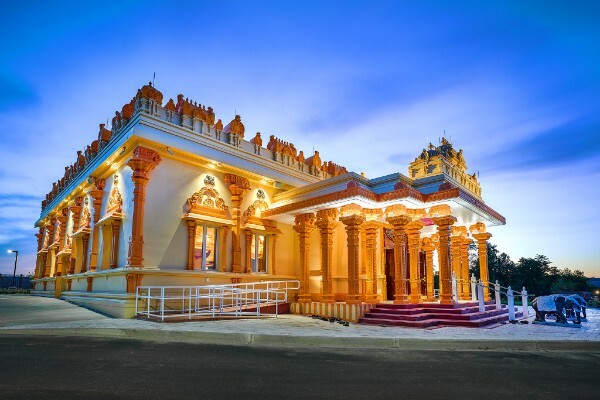 Maryland’s newest Hindu temple, the Sri Bhaktha Anjaneya Temple in Ijamsville, Maryland, bridges the gap between ancient and modern, the old world of South India and the new world of contemporary United States. To achieve this, the temple owners assembled a team of artisans in India and local construction experts, Brechbill & Helman Construction Company, Inc., of Chambersburg, Pennsylvania, who served as the general contractor on the project. The ABC member firm has overseen and built numerous other projects in the state of Maryland and is currently working on a new 17,000 square foot inpatient hospice facility in Hagerstown, Maryland. On the Sri Bhaktha Anjaneya Temple, Brechbill’s expertise ensured the project met the owner’s exacting needs, scheduling their own work around the highly detailed and time-consuming work of the 20 artisans who had come from India to hand carve the temple’s ornamentation. The artisans spent approximately 8 months shaping the intricate masonry and plaster sculptural encasement of the shell. Shilpakala Nilayam, a temple design and build company from Chennai, India, led the initial design effort. The temple structure itself was based on a 1,000 year old temple prototype adjusted to accommodate the contemporary Hindu life while maintaining the religion’s historic legacy. Attention to the smallest detail mattered first and foremost. In accordance with the intense commitment of Hinduism to the formal design and symbolism in temple buildings, Brechbill & Helman also worked closely with the priests of the Sri Bhaktha Anjaneya who provided a strong and continuous stream of leadership throughout the project. The result is a visually rich house of worship and the pride of the local Hindu community. Despite the project’s exacting specifications, it was the fastest built Hindu temple in the United States. Normally the process of building a Hindu temple takes five years from design to completion. The Sri Bhaktha Anjaneya Temple was completed in half the time. Opened in May 2015 with a consecration ceremony known as Kumbhaabhishekam, the Sri Bhaktha Anjaneya Temple now welcomes more than 1,000 devotees each week.